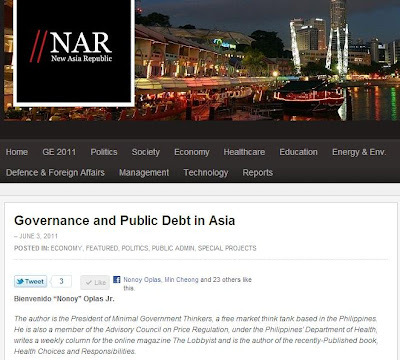 Conversely, it can be defined that Bad Governance = More Public Debt. So, why did this paper choose this particular, narrower (but not necessarily shallower) definition of governance? For the simple reason that being in perennial debt means that a person, a corporation, or a government is continually living beyond its means, i.e. they spend more than their income, and do so on a regular basis. For governments, that means doling out increased amounts of welfare, subsidies and entitlements even if domestic revenues are not enough. The annual difference of this “living beyond its means” phenomenon for governments is called a budget deficit, meaning revenues are lower than expenditures. The deficit is financed by borrowings, foreign and domestic. The accumulation of such government borrowings constitute public debt. Incurring debt is understandable in cases of emergencies. Say a family member is terribly sick and requires expensive treatment, or in cases of important investments, private or public, which are supposed to enable the debtor to become more productive over the long term and not only be able to pay back the debt but have surplus resources later. Let us review first the data for Europe and North America. Then compare the numbers with those in Asia-Pacific. It does not look good that those rich countries that provide huge funds to the UN and the big foreign aid bodies like the World Bank (WB), International Monetary Fund (IMF) and Asian Development Bank (ADB) are themselves heavily indebted. The money that they contribute for those multilateral institutions for lending to poorer countries or countries in deep fiscal crisis, in effect, are also borrowed money. Having sustained high public debt that persists and increases over the decades, is nothing but fiscal irresponsibility of the governments of those countries spanning various administrations and leadership. 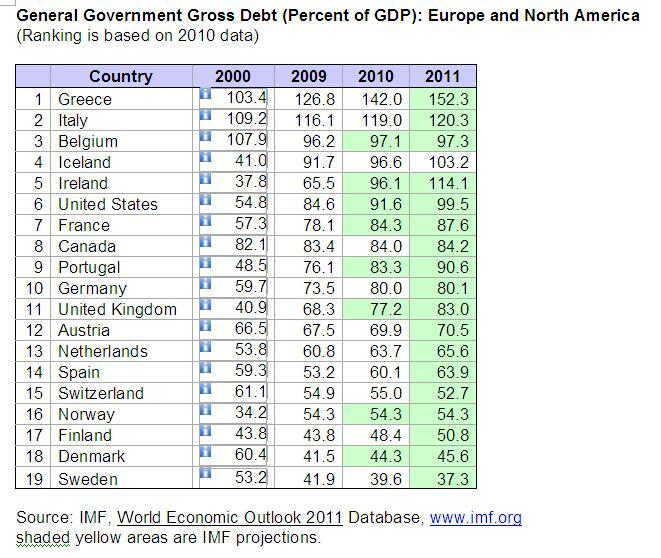 Take note also that the trend from 2009 to 2011 espouses a rising public debt, except in Switzerland and Sweden. This culture of indebtedness, along with policies leading to excessive spending and borrowing, has acquired its own momentum. This constitutes bad governance as current resources are being siphoned off to pay for the excesses and wastes of the past. The implication of succumbing to high public debt relative to GDP size is that interest expense rises as a result. Money that could be used for various social services is diverted to paying off the debt. However, this may not be a big problem for Singapore and Japan since interest rates there are very low; besides, many banks and lenders are government-owned and controlled banks and other financial institutions. This ensures that the bulk of government interest expense also goes back to the government one way or another. We now turn to Asia-Pacific countries; East Asia and South Asia in particular. Singapore and Hong Kong, which both have small populations but are considered the tiger economies of the continent, are highlighted. It is interesting to make a comparison between these two economies because while both compete almost neck to neck in various international studies and surveys on economic freedom or economic competitiveness index every year, their level of public debt is extremely disparate. Unlike in the Europe-North America instance of rising trend in debt/GDP ratio, the case is different in Asia-Pacific. The ratio is declining except for in Japan, Myanmar, New Zealand, Cambodia and Australia (rising trend), and Malaysia and Vietnam (flat trend). 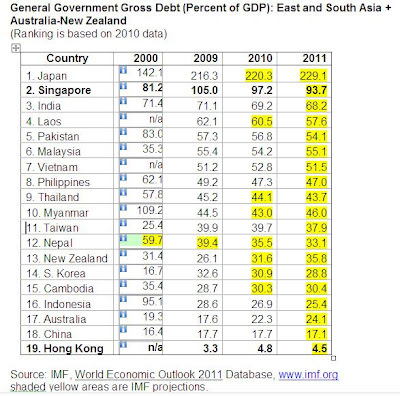 Take note of Singapore’s public debt last year – 97.2 percent of GDP versus Hong Kong’s minuscule 4.8 percent of GDP. And while the trend in Singapore is towards a declining rate in the coming years, still the ratio is high, projected at 88 percent of GDP by 2013. 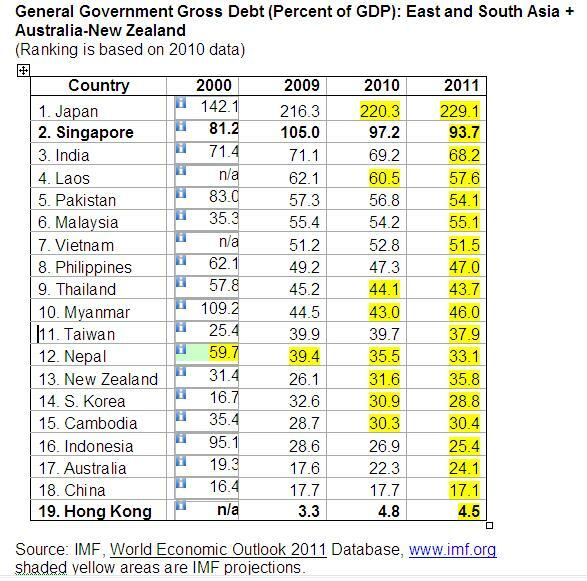 Singapore seems to be following the Japanese “model” of high public debt and more welfare, although most of its debt was borrowed locally (ie, domestic debt). Hong Kong and China adhere to similar models of low public debt and fast economic growth. 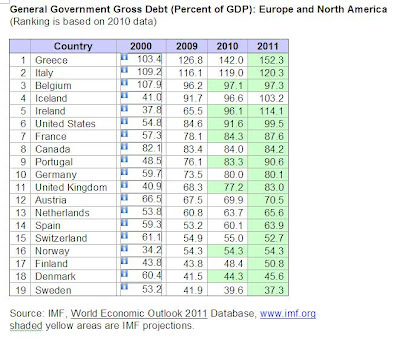 Paying off high public debt with more current and future taxation is bad governance. It is squeezing more money and resources from the pockets and savings of the more industrious and more efficient individuals and private enterprises in the economy, in order to sustain the profligate ways of the government bureaucracies and the political class, as well as the bottomless demand for welfare by some government-dependent sectors of the economy. Governments most definitely have plenty of assets and properties; for example, several dozens, if not hundreds (or thousands), of government-owned and controlled corporations (GOCCs) and government financial institutions (GFIs) including banks. They also tend to own vast tracts of land including huge military camps, in both urban and rural areas. Privatization of such GOCCs, GFIs, public lands and portions of military camps can significantly reduce and ultimately retire the burdensome public debt. It can also spare taxpayers of more forcible transfer of money from their pockets to the government coffers. Unfortunately, privatisation seems to be a far-out solution in the minds of most public administrators in many countries. That constitutes another round of bad governance and fiscal irresponsibility. It is important that advocates of individual liberty and free market should stand their ground and fight endless efforts by the political class to continue expanding governments, the latter of which results in ever-rising public debt and in turn will then require more taxes and forcible contributions today and tomorrow. 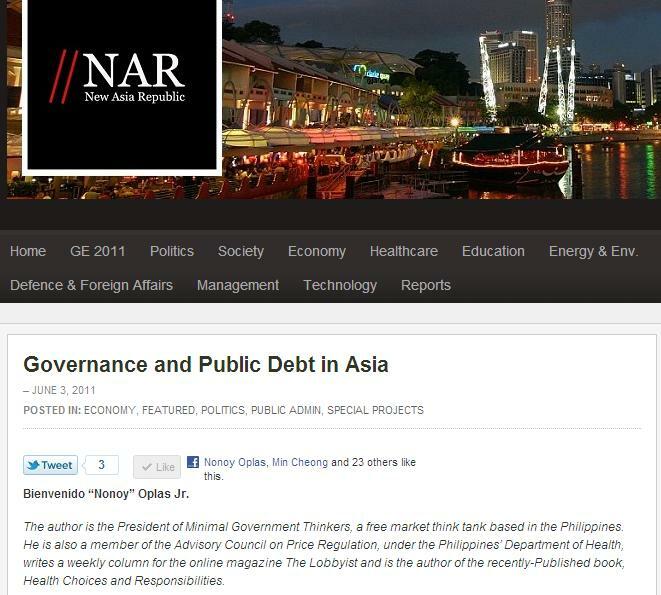 This article is part of the New Asia Republic Editorial Series “Global Perspectives on Good Governance” under Special Projects. The series features the views of people who hold political office, those working in NGOs, military brass, academics and the man on the street from all over the world to shed light on what constitutes good governance and interpretations of the idea based on the unique socio-political and historical culture of any given country/state.